Hi everyone. 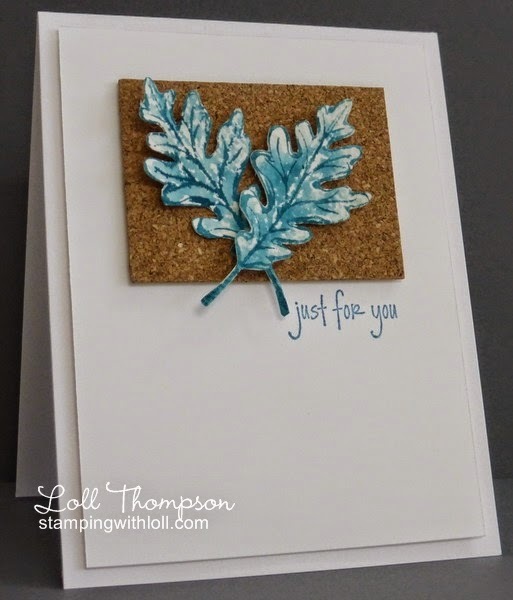 Today's card is for the Splitcoaststampers CAS challenge (#266 - design seeds color chart - still life blues). Don't you just love these colors - they are so pretty!! I really wanted to watercolor, so decided to pull out my favorite two-step stamps from Stampin' Up! - Gently Falling. This set is perfect for using with watercolor paper. I inked my solid stamp (using markers) with three shades of blue from the color palette, misted with water and stamped onto watercolor paper. Once dry, I used the dark blue to ink the outline stamp, misted with water and stamped overtop ... using my Stamp-a-ma-jig to line things up. Oh, Loll...that sweet boy is just adorable! You, lucky, lucky girl! Yes, I do believe we can take creative license and color things as we please :). I love the look of the blue leaves against the cork...fabulous! The blue leaves are beautiful, Loll! Last Fall we had a lot of pink leaves and I'd never noticed pink leaves before. Who knows maybe we'll have blue leaves this fall as they're very pretty! Cooper is ADORABLE! How can you not love that sweet face! Looks like he already knows his Nana! That child is way too cute! Love the card too but that baby! While your card is awesome, the grandson takes the post! HOW CUTE IS HE!!!! Love your blue leaves (of course, since I love blue!) and I love the way the cork is so perfect for the colour challenge! Fabulous photo of Cooper - what a sweetheart! What a great idea using the cork Loll. It adds such an interesting dimension to the whole card. 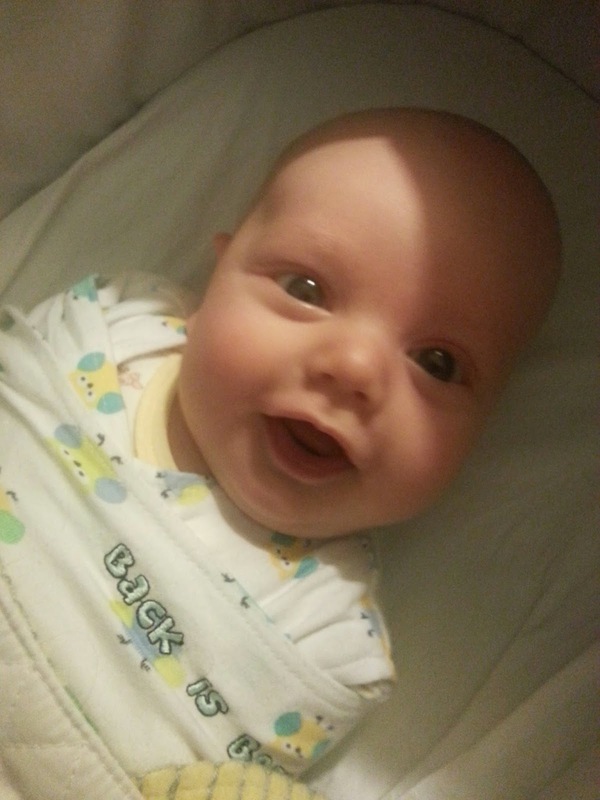 Just love the photo of Connor........looks like he thinks the world is funny! Your blue leaves are beautiful Loll but totally overshadowed by your gorgeous grandson!